Without a doubt ceiling fans are a great way to cool off your Long Island home, but they can be prone to malfunctioning both electrically and mechanically. Our technicians have been doing quality ceiling fan repairs for years and have a reputation for excellence both in Long Island and throughout New York. In addition, all of our certified electricians are licensed, bonded, and insured in New York and have top of the line workmanship and tools to get the job done right. If your ceiling fan is generally wobbly, it could just be that it's improperly mounted. If you have done your best at mounting your ceiling fan but are still experiencing issues, please call one of the professionals at Sure Line Electric Group for immediate resolution. However, some problems are much more involved and can result in either potential safety hazards or a completely non-functional ceiling fan. Mechanical issues with gears, bearings or other internal components of your cieling fan should be fixed immediately to avoid personal injury. 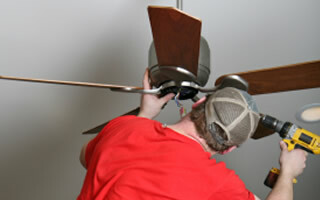 Though we offer resolution for mechanical faults for our Long Island ceiling fan, we specialize in electrical repair. Speed switches, improper voltage and several other issues can present themselves in a number of ways. Never attempt to repair these types of electrical issues yourself as the occurrence of shock is quite common--let the experts at Sure Line Electric Group do the job safely and professionaly. If you are looking for a ceiling fan repair in Long Island, then give us a call today at (631) 240-9663 or complete our request service form.